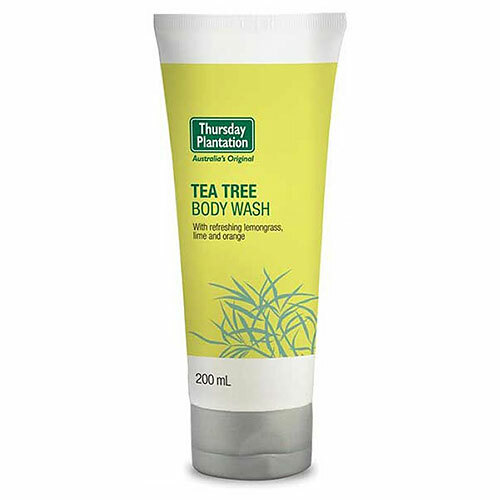 Made with natural ingredients, Thursday Plantation Tea Tree Body Wash delivers fresh and clean skin. It combines essential oils to soothe and stimulate the skin with non-drying cleanser to gently clean and refresh the skin. Contains 100% pure Australian Tea Tree Oil, a natural antibacterial agent. Suitable for dry skin. Aloe Barbadensis Leaf Juice, Aqua / Water, Decyl Glucoside, Coco-Betaine, Glycerin, Glyceryl Stearate, Cetyl Alcohol, Xanthan Gum, Melaleuca Alternifolia (Tea Tree) Leaf Oil, Lonicera Caprifolium (Honeysuckle) Flower Extract, Lonicera Japonica (Honeysuckle) Flower Extract, Equisetum Arvense Extract, Cymbopogon Schoenanthus Oil, Urtica Dioica (Nettle) Leaf Extract, Rosmarinus Officinalis (Rosemary) Leaf Extract, Citrus Aurantifolia (Lime) Oil, Citrus Aurantium Dulcis (Orange) Peel Oil, Achillea Millefolium Extract, Alcohol. Wet skin and apply to the body to create a lather. Rinse thoroughly.It is recommended you skin patch test prior to use. If sensitivity occurs discontinue use. Below are reviews of Thursday Plantation Tea Tree Body Wash Cream - 200ml - Best before date is 30th June 2019 by bodykind customers. If you have tried this product we'd love to hear what you think so please leave a review. Love this natural product, leaves you feeling fresh and invigorated. This is a lovely wash cream to use in the shower. Fresh clean feeling and keeps skin healthy. Have used Thursday Plantation products for years because I think their Tea Tree products are the very best quality. 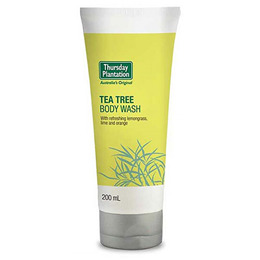 Made with natural ingredients, Thursday Plantation Tea Tree Body Wash delivers fresh and clean skin. It combines essential oils to soothe and stimulate the skin with non-drying cleanser to gently clean and refresh the skin.